More than just romantic, there’s something magical about saying “I do” against a backdrop of the vast blue ocean, or surrounded by lush tropical jungle. For the once-in-a-lifetime moment you deserve, discover the best destination wedding venues in Bali. 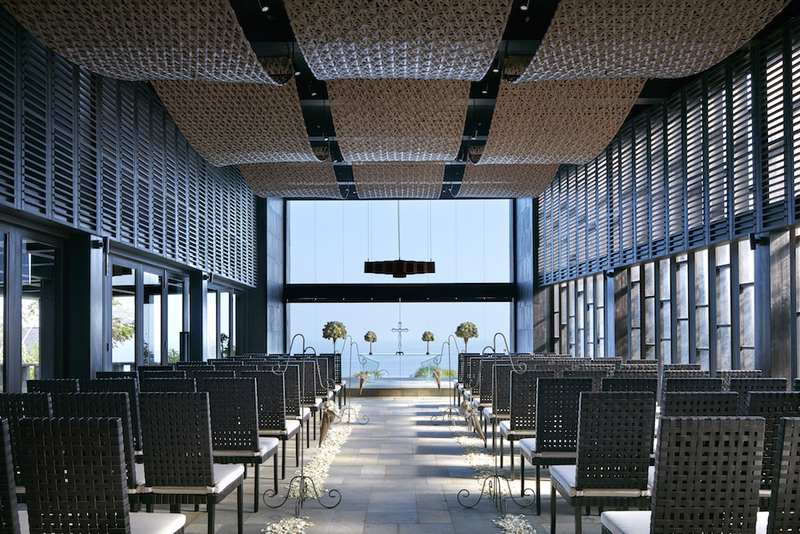 Where’s better to celebrate your infinite love than the glorious Infinity Chapel at Conrad Bali? This dreamy wedding destination has an unparalleled view of the Indian Ocean, which lends some of the calming, laid-back ambiance. 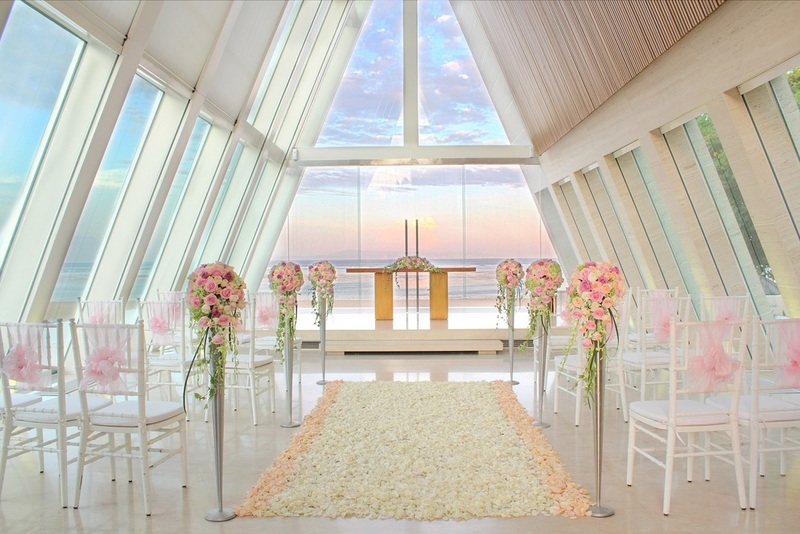 The iconic chapel is versatile enough to contain both a merry festivity and a solemn wedding ceremony. Before entering the majestic chapel, the romantic lit pathway will guide your steps into infinity, starting with exchanging vows for eternity. Part of the award-winning establishment AYANA Resort and Spa, this venue’s service and credibility is beyond expectation. Beyond that, the SKY AYANA venue is top notch, an open deck on the cliff-top extending dramatically to float above the Indian Ocean. Look to the far horizon with your loved one, and likewise to your wonderful future together, while your beloved guests celebrate with you, enjoying the same majestic view. Grand Mirage will help you create the fairy-tale you deserve. With the picturesque backdrop and ample facilities, you’re free to choose the kind of wedding ceremony you fancy, be it a rustic outdoor wedding or a solemn indoor service. Couples can also opt for a classy Royal Balinese wedding, with every ceremonial element taken care of down to the last detail, from the Hindu blessing offerings to the royal carriage and Balinese traditional performers. There are not many things more romantic than saying “I do” in the presence of hundreds of dove, the symbol of love. The White Dove at Banyan Tree Ungasan Resort combines majestic ocean views with architectural brilliance, resulting in the iconic structure floating 70 meters above sea level, stretching from the magnificent cliff edge. The all-white and glass interior reflects an elegance matched only by the clear blue ocean outside. Although especially popular among surf-loving couples, this venue’s charm touches the heart of everyone else with elegant but laid-back wedding aspirations. In Uluwatu Surf Villas, you’ll be exchanging vows in the backyard of a lavish surf villa overlooking the enticing waves of Uluwatu. Besides, you get the best of both worlds with the calming ocean view and intimate garden setting, topped with modern facilities to make sure everything runs smoothly. Tirtha Bridal is a wedding specialist that has helped dreams come true and romantic aspirations realized. 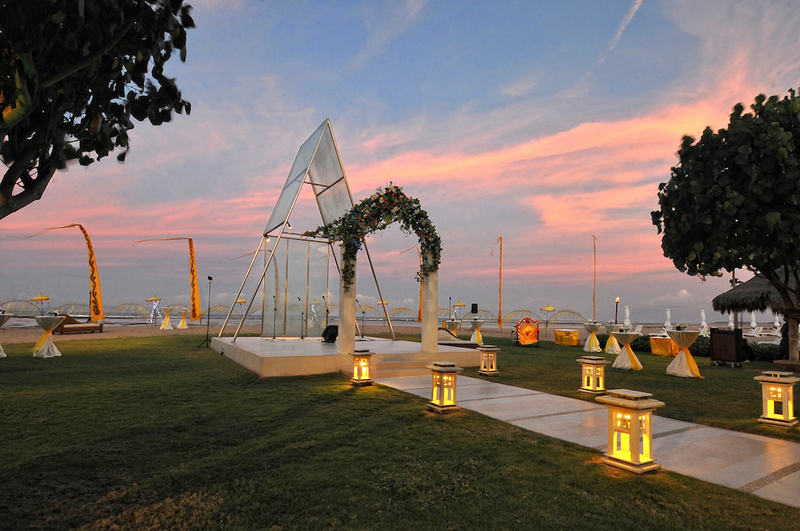 They have several wedding venues to choose from according to your dream wedding scenario. Tirtha Uluwatu embraces the majestic Uluwatu clifftop view, enhanced with their own picturesque wedding chapel on a translucent pool. Fully dedicated for your special day, the team at Tirtha Bridal is happy to tailor every little detail to fit your hopes and dreams, be it the color shade or flower selection. One thing all weddings they organize will have in common is class and elegance. 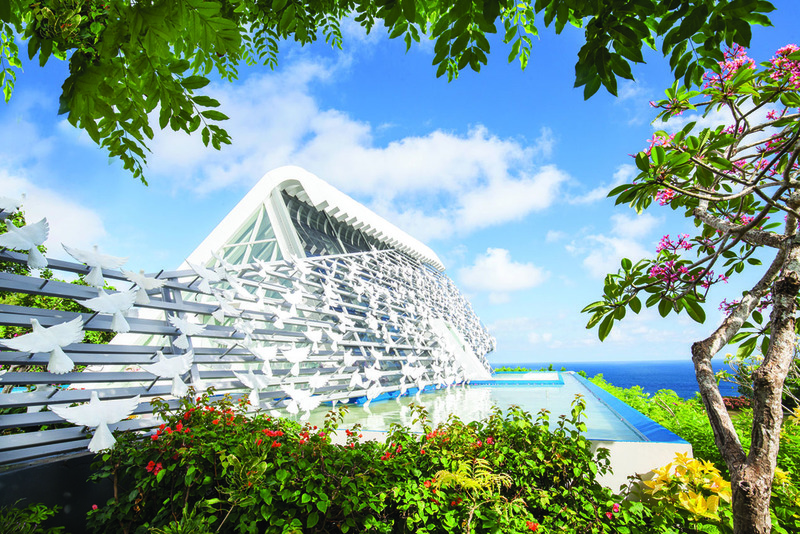 The breath-taking architecture and concept make The Diamond Bali worthy of celebrating your precious day. From the outside, the diamond-like structure bears extravagant views. Inside, the elegance and brightness create a perfect backdrop for your wedding ceremony, with a transparent glass architecture that overlooks the lush greeneries and the Sanur Beach. This spectacular wedding venue also comes with a professional team who know exactly how to create moments you’ll cherish forever. Part of the lavishly stylish Bulgari Resort, this wedding chapel reflects the class and elegance of the whole establishment. Embracing both traditional Balinese design and the tasteful Italian style of the Bulgari brand, this chapel embodies the best of both worlds: natural calming design, rich Balinese symbolism, and sophisticated interior. Perched on a cliff overlooking the Indian Ocean, couples can opt to open the glass wall and have the cool ocean breeze brushing against their happy faces. 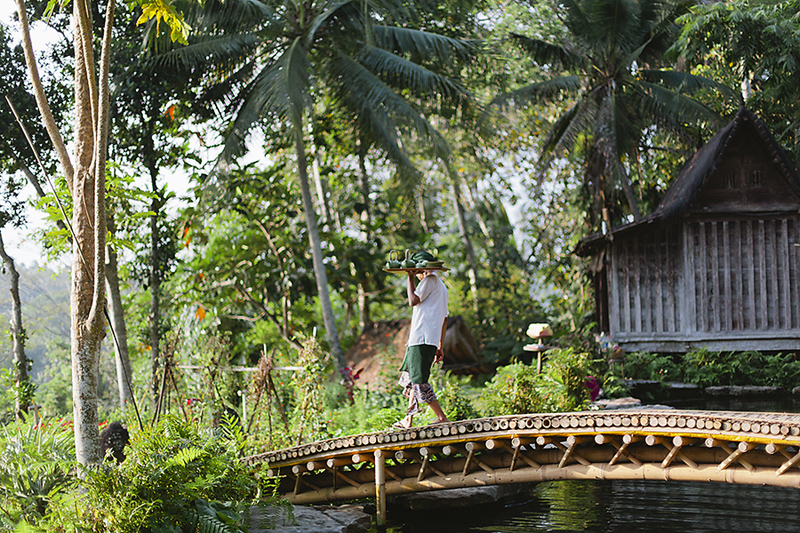 If you’ve always dreamed of a perfect tropical, bohemian wedding, Bambu Indah makes an excellent destination wedding venue for you. From the lush tropical jungle ambiance to the rustic decoration, this venue has got you covered. Whether it’s an intimate outdoor ceremony or country-style photo session, you and your guests will enjoy a distraction-free serene atmosphere enabling you to bask in the happiness.